Guest rooms are filled with luxury amenities for your every comfort and convenience and embrace a modern, tropical decor. Your private balcony or terrace overlooks the azure ocean, lush tropical gardens or lovely pools. Enjoy a cool beverage from your daily refreshed mini-bar. Relax with cable TV. The bath area is spacious and stocked with personal comforts. Enjoy a nap by lovely pools or wander among tropical gardens. Explore the shore line or perhaps you will try kayaking, learn to scuba, play some tennis, or earn how to make fabulous new cuisine. With scheduled daily activities your family will have the vacation of a lifetime! Amazing resort, amazing people. The staff are incredible at this resort. Just returned from the Punta Cana Palm Beach and couldn't have asked for better. Beautiful room facing the beach, resort very clean.Returning next year. One King bed or two Double bed, Air conditioning with in-room climate control & ceiling fan Nightly turn down service,Shower Hair dryer, Direct dial telephone Vanity and full length mirror,Scale CD/DVD Player Complimentary minibar refreshed daily,MP3 docking station alarm clock,Flat Screen Cable TV with remote control,Coffee/Tea maker, Electronic in-room safe,Iron and ironing board,Magnetic key door locks. A Adults only (18 years and older) Air-conditioned Enjoy French gourmet dining in an elegant atmosphere. We just want to thank BookVIP for this wonderful trip. Saw BookVIP on Facebook. Thought we would give it a try. One of the best vacations we've had. I'm staying here now because of BookVIP. I'm having a wonderful time. I just wanted to tell you Thank you BookVIP...We got an all inclusive vacation and everything we wanted in our Dream Vacation! Wow and wow!!!! I was at the Punta Cana Beach Resort from December 14th 2013 til the 21st for my best friend's wedding!!! I couldnt be any more satisfied of everything in this hotel, from the room to the services to the staff to the discoteka to the beach and pools and bars of course!!! The drinks we're amazing, animation team was amazing, including Sander a.k.a POLOLO who was always happy and always entertaining!!!! Dj Luis and Dj Francisco we're amazing on the beach and in the disco, your music beats Canadian bars for sure!!!! The foood was amazing, the chefs we're friendly and so were the waiter's, Minerva is the best :) For the wedding, it was perfect!!! My best friend was so satisfied and it made us all happy!!! Reception Esteban and Lenny were amazing, always there to help and assist we are thankful you are there, you do a great job! In general, I would suggest this hotel to anyone, family, couples, group of friends or even solo, you'll never get bored!!!! I am already organising my next trip to Punta Cana baby!! I'll start with what was great the staff was over the top. They were friendly, welcoming they remembered our kids names and where we were from, which I have no idea how they did that considering the new faces they see each day. We did the preferred club and it was nice to have a few of the extras wi-fi, an assortment of appetizers all through the day, breakfast and lunch at the sea side grill reserved for preferred guests right at the beach You also get a private check-in and out, however it is not at the lobby, it is at the other side of the resort. When we arrived we really we not sure where to go and there seemed to be a little confusion however if you ask one of the guys at the front steps they will arrange someone to get your bags and take you over to the preferred check in. Once we realized we were supposed to go to another area, we understood what the delay was. The resort is a little older but well maintained. Our room was fine but very clean. They are in the process of upgrading the rooms, however ours was fine. I would say an honest review of a 4 star for the room is accurate. a little dated, but clean, comfy beds, great pillows The pool area was very nice, the vegetation was nice however very well maintained. The food was the part I was concerned with when we booked, as I have been twice in the past (at other resorts) and the food was awful. This was the opposite. The food at the restaurants was fabulous. Even the buffet was much more that I expected I certainly didn't expect made to order grilled seafood at a buffet and that was one of the items. Breakfast was also great - made to order eggs, waffles, pancakes, fresh fruit, baked goods. so everyone in my family was happy with the selection. Overall, the reviews I read were accurate and I think that the 4 star rating is also accurate. The few items I listed that were a little less than I expected were not enough to offset all that was wonderful with the resort. A special thank you to Minerva at the buffet, Nelson from the buffet and the hamburger grill, CandyMan and Sander in the entertainment team for making our trip extra special and being so kind to our boys!! We stayed the week before Christmas, all 10 of us, and we paid the extra for the preferred club. We had a fabulous room with a Jacuzzi and a view of the ocean. From the moment we got there Carlos took excellent care of us. He seemed to always be there when we needed something and always with a smile. But he was not the only one to help, we were pampered at every turn. German, our Beach Concierge, brought us drinks and food right to our beach "bed" and helped us with multiple requests and always with a smile and the best attitude, like Carlos. Even though we were prepared for it, there were really no bugs. Flo Maria and Ray were working at all the restaurants we chose to dine at (when not at the beach) it seemed like they were always there, and each time we saw them they gave us great service and made a great meal even more enjoyable. My highlight of the trip was realized with the help of the very friendly Michael who introduced me to Alicia and my deep tissue massage at the Spa. The experience began at the Hydrotherapy pools (for me it was like a super jacuzzi) and then off to the best massage I've ever had, I actually nodded off for a second. I just can't get over how friendly and cheerful everyone one was who helped us. Our stay at the Punta Cana Resort. Familia! My husband and I are currently at this resort (Dec 2013) returning home tomorrow. We would love to be spending another two weeks! The girls in the Preferred Club are most helpful and will go out of their way to meet all of your wants/needs. This is not our first trip to a Punta Cana resort , nor will it be our last! Check in painless - room is ready on time! The guys with the luggage take you to your room while explaining features of the resort along the way - very helpful. Love the restaurant set up - no pre-booking so you can go to an a la carte restaurant your first day and everyday thereafter for dinner. That feature alone has us coming back to a resort twice each year. A big shout out to Christina, Ray and Tito at the Sea Side Grill where we have breakfast and lunch every day and often dinner as well. Excellente all of you!! Our favourite place of an evening is dancing under the stars in front of the Bridal Gazebo. They have a wonderful duet singing Latin songs - salsa, meringue and bachata. Love them! They and Elizabeth, the lady servicing drinks there, made our evenings VERY special. Thank you, thank you, thank you all! Very excellente! The Entertainment team are wonderful! Love all of you, but a special shout out to Woody, who danced every evening with me during our stay. Love that meringue Woody - you sure can shake it! Where do you get all that energy? If you love to dance and don't have a partner, no problema the entertainment staff - guys and gals - all will spin you across the floor. They even dance with the children - fabulous. My husband enjoyed dancing with Mathilda (you are a wonderful dancer). Unfortunately for the rest of you, you won't have this same privilege as Mathilda is now working with the Spa folks. She always stops to talk with us every day as she makes her rounds, ensuring all our needs are met! We will miss you Mathilda. Jose is the poolside waiter, and while we are not big drinkers, he is always ensuring we have water, juice, cola or whatever we would like. Much thanks Jose you are excellente! "Excellent service but Hotel not 5*"
My partner and I have never been to a hotel where we felt so well looked after, from the minute we arrived until we left. We had a 3rd floor room in block 8. It was beautifully quiet and had a "tropical" view ie over a small palm filled garden towards a forest. Some rooms in that and other blocks may have been looking straight into the "forest". The room was a good size and the only grumble we had was that there was not enough drawer space. The bathroom could do with a face lift and as other guests have said ,it was easy to soak the floor when having a shower. The food was amazing -we never had a bad meal. We tried all the restaurants , our favourite being Bordeaux -child free! The seaside grill was amazing but due to high winds we couldn't always sit outside, or see the sea as screens had to be pulled. The staff in all the restaurants were so friendly and helpful it would be unfair to name any specific person. The grounds and pools are beautifully maintained , though the pools could have been a bit warmer! There are more than adequate loungers around the pools and on the beach, though it would have been nice to have a few more umbrellas around the pools- not just for keeping the sun off but for sheltering under during a tropical shower (in true British fashion !) The drinks service around the pools and on the beach was excellent and we never had any problem getting drinks in the bars (without holding up tips as one reviewer has claimed)- sadly some people at the bars were very rude to the hard working staff if they weren't served immediately. We loved the evening bar at the wedding gazebo, listening to all types of live music. We only went to a couple of the evening entertainments. The Brazil show in the theatre was good, but the "Water and Light" show at the pools was amazing. All the staff were so pleasant and helpful -were the constant smiles on their faces due to the ubiquitous rum ! The one person we would like to single out is Mr Milan the Assistant General Manager. He seemed to be around from dawn to dusk (and even later) checking with guests and staff they everything was OK, and had an excellent attitude to both and took comments from guests (both good and bad) on board. Thank you. My husband and I stayed here from Dec 8 to the 15th, to celebrate our wedding anniversary. The resort was only 20 min away from the airport. I will start off by saying we had no complaints. I can see people commenting below in regards to construction, but I can assure you we heard no such disturbances. Just other guests noisily entering and exiting their rooms, that's it. The staff is EXCELLENT. A shout out goes to the entertainment team, Gasolina, Cuchi, Woody, Red bull, Candyman and Miss Macerena are doing an impeccable job entertaining the guests. There are entertainment shows every night, live music every night, zumba by the beach, basically you will not be bored at this resort. The food is DELICIOUS, there are 6 restaurants open for dinner, 4 a la carte, and 2 buffets. I would highly recommend El Patio, their fajitas are a must try. At Bordeaux, the surf n turf is amazing. Another must try is the Japanese food at Himitsu. If you are confused about where to book your excursions from, we recommend amstar as they are associated with the resort and are reliable. We booked an excursion to Saona island through them and truly enjoyed the Caribbean Sea. Overall, the pools were clean and the beach had small amounts of seaweed (didnt bother us), we had a great time and would definitely come back. After three weeks Im able to write something about our vacation finally. I thought a lot about the time we spend in Dominican Rep. and in Punta Cana and I must say it was best vacation in my life. 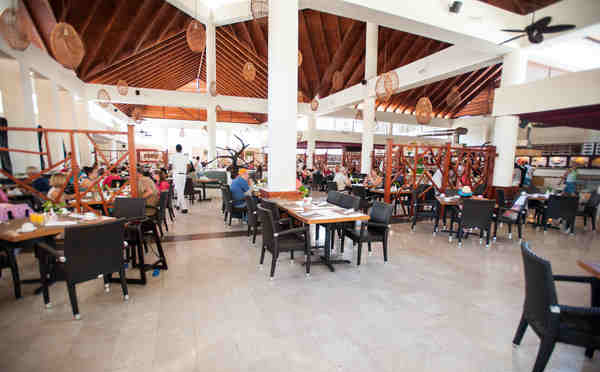 No discussion, the resort, the service, the food is on high quallity but what I want to highlight is stuff you have there. Cleaners, waiters, managers, entertaiment stuff... all these people were so kind, professional, brilliant... really. Im still fascinated. Especially I want to write about one of your employee from entertainment stuff. His nickname is Redbull and he level up our holiday. He makes us smile several times a day and give us so much energy. He has a gift to acquainte guest and entertain them. So i want to thank him this way again. What else I should say... It was really wonderful holiday. So thank to all the others, which make it so excellente also. Hotel is close to the airport so it is a short drive. There is a little town near by, so you are pretty isolated. The staff was wonderful from Ermillio the waiter at breakfast and dinner, Junior the pool bar bar tender, Nelson at the beach and shack, and the entertainer at the pool. The staff is what makes this place great. The seaside grill is like eating at a 5 star restaurant. The Mexican restaurant was super along with the Japanese restaurant. We celebrated a family wedding which was lovely and the food was decent for a wedding. It is very windy there so ensure you have jacket for night time and sometimes during the day. We enjoyed the beach which was kid friendly. We took a snorkel boat trip with Seapro connected to the hotel. Everyone was great! We used the kayaks which was fun and my family enjoyed the scuba lesson at the pool. We loved our week at this wonderful resort. The staff is outstanding -professional,well trained , warm and welcoming. We were always greeted with a beautiful smile and outstanding service from Lucia our room service person to Lily a hostess to Santos a bartender to Pedro the GM. The resort is beautiful and meticulously maintained.This resort is not so big that you are reduced to a number wearing a colored wristband.You are a guest and you feel like a VIP. We were spoiled and it was great fun. "LOVE THIS PLACE! Great rooms, food and EXCELLENT service." We absolutely love this place--for pleasure and for business. We went as a family in February and had such a good time that we hosted 28 people there in October for a business appreciation function. They were wonderful! The GM Pedro is thorough and always walking around to help. The groups coordinators and event directors Elizabeth and Melani are detail oriented and looking for any way to make your event even more special then planned. The Preferred Club team is amazing as is everyone else on the property--they really enjoy having you there as a guest and it shows. It's not just work to them. Don't spend hours trying to figure out where to stay or where to plan your wedding or group function--book it here. You won't be sorry. I took 28 people and not ONE had a negative thing to say. Do it! Wow and wow!!!! I was at Punta Cana from December 14th 2013 til the 21st for my best friend's wedding!!! I couldnt be any more satisfied of everything in this hotel, from the room to the services to the staff to the discoteka to the beach and pools and bars of course!!! The drinks we're amazing, animation team was amazing, including Sander a.k.a POLOLO who was always happy and always entertaining!!!! Dj Luis and Dj Francisco we're amazing on the beach and in the disco, your music beats Canadian bars for sure!!!! The foood was amazing, the chefs we're friendly and so were the waiter's, Minerva is the best :) For the wedding, it was perfect!!! My best friend was so satisfied and it made us all happy!!! Reception Esteban and Lenny were amazing, always there to help and assist we are thankful you are there, you do a great job! In general, I would suggest this hotel to anyone, family, couples, group of friends or even solo, you'll never get bored!!!! I am already organising my next trip to Punta Cana baby!! "Definitely a 6-Golden Apple Resort!!" My husband and me traveled to Punta Cana last November. First time in this hotel. We were sincerely a little bit worried about the reviews!! I cant believe how someone can be unsatisfied there!! Staff was amazing; front desk staff was very helpful, wait staff was polite and entertainment team was so funny!! In particular, we would like to say thank you... Ingrid Rodriguez... You are... AWESOME!!! We are looking forward to visit you again next year. The beach was wonderful and the pool, as well. Nice food and drinks. We cant wait to go back! My stay at Punta Cana far exceeded my expectations! I went for my wedding and was just blown away by my Wedding Coordinator's attention to detail, her friendliness and professionalism. The amazing thing was, ALL of the staff was the same way. Our room was beautiful and our ocean view was perfect. Will I go back? ABSOLUTELY! My wedding was perfect! My friends and family were so pleased which made it even better for me. The grounds are beautiful, rooms are comfortable and clean. It's the service that makes the difference. Top notch service at all times everywhere we went. Don't hesitate to make Punta Cana next vacation resort! "Escape to a great oasis of luxury, fun and family." This is our third trip to this resort in a year. We usually don't visit the same place twice - let alone 3 times in a row.... in a year! The staff is wonderfully attentive (one of the main reasons we love DPC) . The resort is beautiful and the food, restaurant and bar service are all top notch. We are here as I write this. Last week was very full with holiday vacationers. This week the resort is considerably less packed. However, the service has been excellent - full with guests or not. The GM, Pedro Thomas runs a very tight ship and it shows. EVERY employee is on point and on their game. I can't stress how fantastic the service is here. On the preferred side German, Joel and Jose have made sure no one has been thirsty or hungry on the beach for even a second. Alexandra is a pleasure to have as a preferred lounge concierge as is the entire staff. 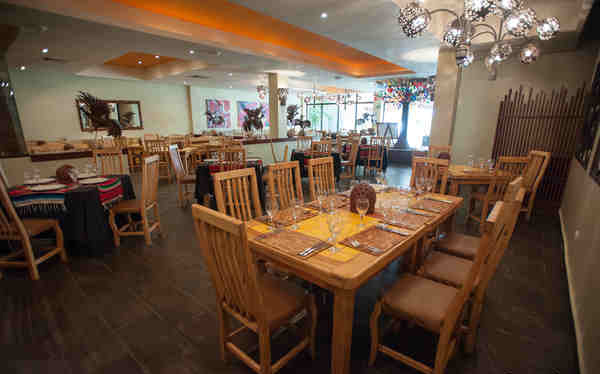 The restaurant staff (Italian, French, Mexican and Japanese as well as the buffet) are great and the food is five star. Preferred side members also have another restaurant, the Seaside grill, to choose from...... which is awesome and has THE COWBOY, arguably the best steak sandwich I've ever had. I could go on forever on how great this place is and how wonderful the accommodations are. The beds are comfortable. The mini bar is great. The cable Tv is very good. The bath and shower are great. The beach is breathtaking. The water is clear and WARM. The many pools are beautiful and there are a lot of things to do (excursions) . I'm headed back to the beach and then over to grab a cowboy for lunch. The strongest thing I can say about this paradise of a vacation destination is that I've never heard one bad thing/complaint from any guest here ever in three trips here..... and talk to A LOT of people. If you come here once, you'll be here twice (at least!) I guarantee. Perfecto in the French resturaunt, Angel in the Mexican, Ray in the Seaside and Italian, Gasolina, woody, candyman, matilde you are all so wonderful. Cuchi is the Charo of the Dominican Republic and Dreams is lucky to have such a great spirit and entertainer on staff. She will make your vacation! I look forward to the next time I step out of the cab and my dear friend Carlos says "welcome home Pallas family "...... because........ with the wonderful job they do, we do feel like this is home. Well done PUNTA CANA. we 'll be back again and again.!!!! When you arrive here tell them "el congrejo" sent you. They'll take extra special care of you! I gaurantee! I would like to say that My daughter, grandchildren and I had a excellent vacation at the Punta Cana. I was really impressed with the staff and the attention they gave everyone on the resort. I am still in awe about the beauty and manner in the hospitality. I would like the General Manager to know that I had to contact the American Embassy because I became very ill. Without hesitation Lisselle Dra. Mejia was like a Angel and helped me so much. I will never forget her kindness. She called and checked on me to ensure that I was ok. I had a infection and a rare illness that was progressing. Please give her the highest commendation an employee can get. I feel her expert manner and decision making was beyond approach and she should be recognized for giving our family the best. My grandson said it best, we will always remember our vacation at the Punta Cana. "Wedding Services were Top Notch"
Our daughter recently got married at Punta Cana, and everyone agrees it was simply magnificent. THE WEDDING COORDINATOR: Julie was our wedding coordinator, and I cannot say enough about her She was the best! She took care of every detail, and was always accessible via a phone she provided for my daughter. Julie translated the judges statements during the legal ceremony. She didnt just repeat the words in English but did so as if she herself was presiding over the ceremony. She translated with feeling and a genuine smile on her face. She made us feel like we were the only wedding party shed ever assisted when in actuality she has one almost every day. THE WEDDING: My daughters symbolic ceremony was held in the gazebo which was beautifully decorated. They dont skimp on the flowers at all! The flowers which hung from the pillars were later laid on each side of the main centerpiece on the head table at the reception. There were waiters at the end of the recessional with trays filled with champagne for the guests. The security was very subtle but very effective at keeping resort guests from interfering with the ceremony. THE RECEPTION: We missed the cocktail hour because we were with the photographer, but everyone seemed to be having a great time when we arrived. We had a cigar roller there which the men and women alike enjoyed. The reception area was magnificent. The tables were arranged on an island in the middle of the pool. The tables were immaculate, the centerpieces bursting with flowers. There were 17 huge roses on the one I took to make potpourri. It rained three times during the reception; however, the staff was quick to bring umbrellas. I cant speak for other wedding parties, but it didnt slow ours down at all. Some people changed into more casual clothes, but even those who didnt stayed and enjoyed the party through the rain showers. THE PHOTOGRAPHER: Gaston was fantastic. I dont know why, but I was not expecting the photos to be as creative as they were. Ive never been happier to be so wrong! Friends have commented on Facebook that theyre the most beautiful wedding pictures theyve ever seen. Along with his photographic talent, Gaston is the easiest person to work with. He is such a sincerely nice guy! He was great at making sure everyone knew where to be for the pre-wedding photo shoots and clearly outlined everything he was going to do in advance. After the ceremony he flawlessly arranged all 50 guests for a group photo shoot. We were lucky and got Gaston by chance. If youre getting married, ask if you can have him as your photographer. You wont be disappointed. Beautiful property close to airport, lot of a la card restaurant, coffee house, even kids club...Great pools,nice beach, stuff is very helpful. Senor Milan is great guy whom you have to met. Funny, and what ever you want,he is The Man. We have beautiful weather, my wife and I have nice time there. Next time we will go with kids. Great All inclusive hotel. I will return. We met a lot of new friends there. We just returned from an 8 day stay at Punta Cana beach. We had a wonderful time with our two girls. We stayed in preferred and in our opinion was worth every dime extra. They really made you feel special. Bottled beer was a big thing for us because its so much better than draft. 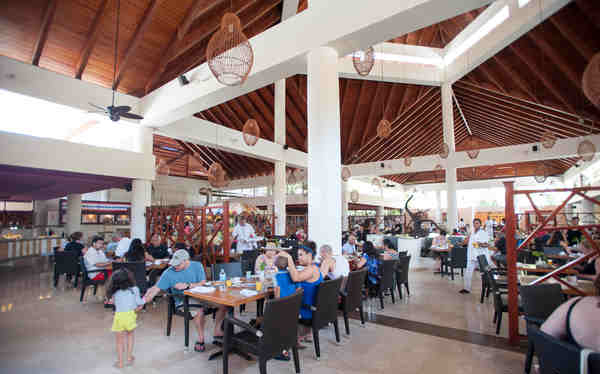 It also allows you to eat every meal at the best restaurant at the resort in our opinion. Seaside Cafe was delicious and the staff was amazing. (Tito, Chrstina, Franklin) they were always very kind expecially to our 20 month old. They treated her like a princess. When you first arrive they Welcome you Home and they treat you like that everyday. We never met a staff member who wasnt amazing. They truely did everything to make our stay special. Ask for Carlos when checking in! He was a great guy and really went out of his way to make my girls feel special. The entertainment crew was also awesome. They were great at their jobs. They were fun and outgoing and did their best to get to know you. Candyman and Pololo were the best. There are alot of activities to do throughout the day. Our older daughter loved the exploerers club and all the activities they do. I would say that if your looking for a big party scene this might not be for you. It def slowed down at night. It was perfect for our family. I would recommend this place to anyone who asked. We loves our stay and would definitely go back. The people really made the resort they were amazing and did everything to make our stay great. To some other reviews. We had no problem with our air conditioning, our room was very comfortable. We were on the third Floor so we had vaulted ceilings which made the room feel big. To those who didnt like the food, we mainly ate at the seaside or the world cafe. We tried the Italian and it wasnt to our liking. The steak and seafood at the seaside was amazing so we ate there most nights.